Posted by grhomeboy in Movies Life, Movies Life Greek. The crew of the romantic comedy ‘My Life in Ruins’ at the Acropolis. In the film Nia Vardalos, plays a tour guide. Here is Nia Vardalos with Greek Culture Minister Michalis Liapis and Donald Petrie. Decades after serving as the setting for hit films like “The Guns of Navarone” and “The Big Blue”, Greece has elicited help from Oscar-winning actor Tom Hanks to get back on Hollywood’s radar. The Hollywood star, whose wife Rita Wilson is of Greek descent, is helping bankroll two movies which officials here hope will translate into extra tourist arrivals at the country’s archaeological sites and island holiday spots. One production stars Nia Vardalos, the Greek-Canadian writer and star of “My Big Fat Greek Wedding”, the 2002 romantic comedy that became one of the most successful independent US box office productions of all time. Titled “My Life in Ruins” the new comedy centers on a tour guide played by Vardalos and was given rare permission to shoot in key Greek archaeological sites, including the Acropolis in Athens, Delphi and Ancient Olympia. The second production is a film version of the hit Broadway musical “Mamma Mia” starring Pierce Brosnan and Meryl Streep, and was shot on the Aegean islands of Skiathos and Skopelos in August. The back-to-back Hanks projects are a welcome boon to a Greek state eager for a fresh start after decades of scaring away big-name productions with a combination of nightmarish bureaucracy, poor organization and sheer ineptitude. “In the 1980s, the word in Hollywood was that Greece was an unwelcoming place to shoot a film,” acknowledged Markos Holevas, director of the Hellenic Film Commission set up in May to facilitate foreign productions in the country. “Now there is a desire to change things… the Greek state has realized the benefits and wants to promote Greece through film… and Tom Hanks and Rita Wilson were the first to respond to this policy. The message is: Forget the past, let’s make a new start,” Holevas said. Greece’s picturesque islands, many of them major tourist destinations, have provided the backdrop for scenes in recent films, but have not served as major movie locations. The Ionian island of Cephalonia was in 2001 the site of “Captain’s Corelli’s Mandolin” starring Nicholas Cage, while the Aegean island of Santorini had a scene in “Tomb Raider: Cradle of Life” with Angelina Jolie two years later. Greece also apparently had a chance to host Oliver Stone’s 2004 blockbuster “Alexander” but the government failed to pursue the offer, Holevas said. The country boasts impressive archaeological sites that have long been in demand for both television commercials and films, but projects have routinely run afoul of strict regulations laid out by Greek archaeologists. And amid price hikes following its adoption of the euro, Greece has had a hard time competing with neighboring Balkan and Eastern European countries which can combine lower production costs with similar landscapes for location shots. “Foreign productions have a tendency to get ripped off here,” noted producer Christina Aspropotamiti, who worked on an American documentary shot in Athens last year. 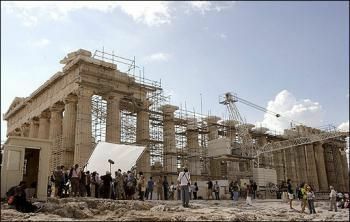 She said she was stunned when she sought permission to film long-range shots of the Parthenon, the classical temple atop the city’s famed Acropolis citadel. “The local archaeological office asked us for 1,500 euros ($2,120) per square meter (per 10 square feet) of the entire Acropolis site… at those rates it would have made better sense to just buy the place,” she said. “We had trouble with the film unions, which were communist-dominated at the time,” Gage said. “There was sabotage overnight as we began the shooting in Athens… equipment was broken, you’d find your lights busted.” When the production company decided to relocate to southern Spain, Gage’s home region of Epirus lost millions of dollars, he said. “It was very unfortunate, we spent the equivalent of $450 million in today’s figures that could have been spent in Epirus, one of the poorest areas in Greece. It would have benefited the area considerably,” he added. Posted by grhomeboy in Games & Gadgets, Media Radio TV, Music Life Greek, Telecoms. Cyprus’ IPTV provider PrimeTel has launched an interactive TV application called VBox, which allows users to create their own individual on-demand music channel on their set-top box. Viewer have access to a library of music video clips, both Greek and International, divided into music categories such as Greek, pop, laika, international, rock, and ballads. Users can make their choices and add up to 20 clips to the playlist they create. Playlists can also be saved for future use. Additionally users can access pre-made collections and lists created by various music producers. VBox is an interactive application that runs on the set-top box and is accessed through the PrimeTV on-screen menu. The majority of the processing is performed on the PrimeTV video server, where the entire music video database is also saved. When the user has finished specifying the music selection, the list of songs is saved on the box and is transmitted to the video server for the execution of the requested search. When the user starts playing the playlist, the STB sends the command to the server, which in turn streams the content exclusively to the user who has sent the request. Posted by grhomeboy in Arts Events Greece, Ballet Dance Opera. Maurice Bejart’s ballet set for two shows this week > Motion in harmony. Berjart’s career-spanning ‘L’Amour, la Danse’ comes to Athens this week. The Bejart Ballet of Lausanne, the legendary Maurice Bejart’s current dance troupe, will be in Athens this week for two performances at the Pallas Theater on Wednesday and Thursday. At the time of writing, it remained unclear whether Bejart, who has suffered health problems recently, would be able to attend the performances and offer his admirers the opportunity to applaud the dancer, choreographer and man of wisdom for his lifetime’s achievements over the past 50 years. Bejart, now 80, ranks as one of the most significant artists of our time. He revolutionalized dance and managed to draw bigger audiences while maintaining the art form’s spiritual dimension. For the upcoming Athens performances, organized by the non-profit organization ELEPAP, the Hellenic Society for Disabled Children, Bejart, who has established an affinity with this country over the years, will present his most recent production, “L’Amour, la Danse,” which culls leading choreographies from his career. Both his life’s work and personality run parallel with the history of dance. Twenty-five years after forming his Ballet of the 20th Century in 1960, Bejart relocated to Lausanne where he has since lived and worked. His artistic world holds places for the likes of Friedrich Nietzsche, Richard Wagner, Charles Baudelaire and Gustav Mahler and his groundbreaking ballets have allowed for the co-existence of incongruent components, such as jazz elements with traditional African rituals, or the techniques of Martha Graham with the power of expressionist dance. Bejart, like all major artists, is a man of contradictions. On many occasions, the daring nature of his work has proven to be a challenge. Most critics tend to agree that Bejart produced his greatest ballets in the 50s and 70s, when it is generally agreed that the artist took classical dance to wider audiences. “I wanted to change both the genre and the audiences. I would rent out 5,000-capacity stadiums for a month and offer cheap tickets. I managed to have dance accepted at the Avignon Festival, at open-air theaters and public grounds. In my opinion, dance should not be elitist. It is a global language, an international tongue that brings people closer. In traditional dancing all over the world, the first thing dancers do is offer their hands,” Bejart had remarked in a former interview. His work was deeply influenced by the Far East, both in terms of technique and school of thought. His father, a philosopher, spoke and wrote Chinese. Bejart himself studied Zen under the tutelage of Deshimaru, and, following a series of visits to Iran, was deeply influenced by a Kurdish Sufi and embraced Islam. “Through dance, I try to offer a feeling of tranquillity and unity to the individual of the Western world, who is so egocentric, fragmented and divided,” Bejart has said. Applying Eastern philosophy to his work, he sought to change how audiences perceived dance, aiming for a ritualistic approach. “Everything is sacred, from eating and sleeping to making love and dancing. If God was not omnipresent in our lives, there would not have been a reason to name him. God is not a bearded old man who governs the world from afar. He is among us, he lies within everyone of us. Which is why fanaticism, intolerance, and social segregation are all insults to divinity. Divinity is unity,” Bejart has stated. Over the years, Bejart has presented scores of magical productions in Greece, including “Romeo and Juliet” and “The Magic Flute.” Bejart’s dance company last performed here in 2002 at the Herod Atticus Theater, staging a production based on music by the Greek composers Mikis Theodorakis and the late Manos Hadjidakis, both old friends. “I met Manos Hadjidakis many years ago and our friendship was a truly unique experience. And as for Mikis Theodorakis, my projects set to his music have traveled the world with great success everywhere,” Bejart stated in an interview in the summer of 2002. Posted by grhomeboy in Football. Frontrunner AEK maintained both its lead and perfect record in the Super League after five rounds of play with a 1-0 win over Larissa Saturday. AEK took the lead early in the game, in the fourth minute of play when Brazilian midfielder Gustavo Manduca dribbled past two defenders and unleashed a powerful shot from 20 meters. Also Saturday, defending champion Olympiakos defeated Panionios 4-1 at home to maintain second place, four points behind AEK. In Thessaloniki last night, Aris defeated local rival PAOK 3-1 to remain fourth, six points behind AEK. Panathinakos earned a valuable 2-0 win at Veria yesterday for third spot on 10 points. In other games, it was: Apollon Kalamaria-Ergotelis, 2-1; OFI-Asteras Tripoli, 0-3; Levadiakos-Xanthi, 2-1. Atromitos was due to host Iraklis later last night. CareerBuilder.com has agreed to buy Greek online jobs site Kariera.gr, expanding its network of international job posting sites. CareerBuilder, owned by McLean-based Gannett along with fellow newspaper publishers Tribune Co. and McClatchy Co. as well as Microsoft, did not disclose financial terms of the acquisition. Kariera, which started in 1997, also publishes a weekly career-related newspaper. CareerBuilder says its acquisition will add thousands of job listings to its international network. CareerBuilder has launched its own sites in Canada, India and The United Kingdom and has acquired existing sites in Sweden and The Netherlands. It also has partnerships with existing job sites in China and South Korea. Posted by grhomeboy in Environment. The European Court of Justice is to rule this week on how to punish Greece for repeatedly violating directives on wastewater management. Greece’s main transgression is its failure to provide 24 small towns, including many tourist resorts, with adequate waste-processing units, an obligation it has faced as an EU state since 2000. In a ruling due on Thursday, the court is expected to issue a strong warning that could lead to a heavy fine. The affected areas include much of eastern Attica, a large section of Thessaloniki, the Cretan port of Iraklion, Nafpaktos, Igoumenitsa and Tripolis. In parts of eastern Attica, such as Koropi and the Thriasio Plain, near Elefsina, residents reportedly have taken it upon themselves to dispose of water from their washing machines and tanks into street drains. According to the Environment and Public Works Ministry, Greece has 160 waste-processing units, dozens of which are believed to be non-operational due to poor design. Another 50 such units are under construction, the Ministry says. Another problem is the absence of any monitoring organization to check that existing units are operating properly. “The real question is whether processing units are operating and how well,” said Andreas Andreadakis, the Director of the National Technical University of Athens’s sanitary technology laboratory. Meanwhile, as precious water resources dwindle, Greece is under pressure to recycle used water, including that produced by waste-processing units. At present, most water processed in such units is subsequently dumped, mostly into the sea and in rivers, while other European countries are increasingly reusing their “dirty” water in irrigation and industry. Israel has implemented measures that, it claims, will lead to recycled water being used for 100 percent of all irrigation and industrial purposes by 2025. Germany and France have also made significant progress in this area. Greece, however, continues to squander 84 percent of its clean water on irrigation and has failed to undertake any major initiatives to recycle its used water. Posted by grhomeboy in Politics. Prime Minister Costas Karamanlis on Saturday sent a stern message to the Former Yugoslav Republic of Macedonia (FYROM) to cooperate with Greece in solving a dispute about the country’s official name ahead of today’s scheduled proposal for a compromise by a United Nations envoy. “Persistent intransigence and stances that ignore historical fact do not help build good neighborly relations,” Karamanlis said in a speech before ruling New Democracy’s central committee. “It is decision time,” he added. His comments came ahead of a proposal, to be made public at 4 p.m. today, by UN mediator Matthew Nimetz, who has been entrusted with mediating in the name dispute. According to a report in yesterday’s Ethnos newspaper, Nimetz will herald a new, and final, round of talks on the issue on the ambassadorial level, due to begin on November 1. It was unclear what might be proposed by Nimetz, who in April 2005 suggested the composite name Republika Makedonja-Skopje, which was accepted by Athens but rejected by Skopje. In a related development on Saturday, a 150-member FYROM sports team walked out of a youth athletics competition in northern Greece after objecting to being introduced as coming from FYROM.